The view outside your room at Turtle Inn, Belize. All photos by Kate Donnelly. 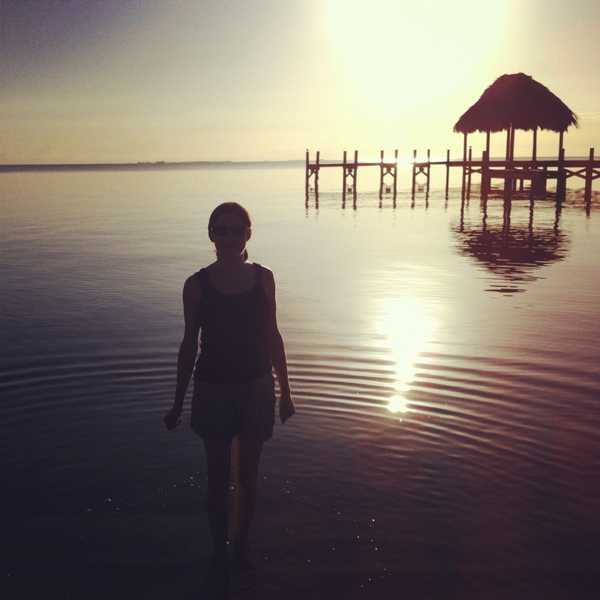 Kate Donnelly began her Belize adventures with a few days in the jungle at Francis Ford Coppola's Blancaneaux Lodge, then ended up on the beach at Coppola Resorts' Turtle Inn. It's a big sun, and someone's got to swim under it. PLACENCIA, Belize – Wake up at Turtle Inn, the Francis Ford Coppola resort in Placencia, a sleepy Creole fishing village in the Stann Creek District of Belize, at the southernmost tip of a narrow, 26-mile peninsula. You're nowhere, and you have a busy day in the sunshine ahead of you. Sunrise: Mornings here are quiet and peaceful. Request a wake-up call just so you can use the shell phone, then walk out your seafront Balinese-style cottage (Villa One) a few steps into the Caribbean for a morning swim. Rinse off in the outdoor shower in your private garden before stopping by The Mare restaurant for warm coffee, fresh fruits, and beignets. Miss Ellie, ready to depart. 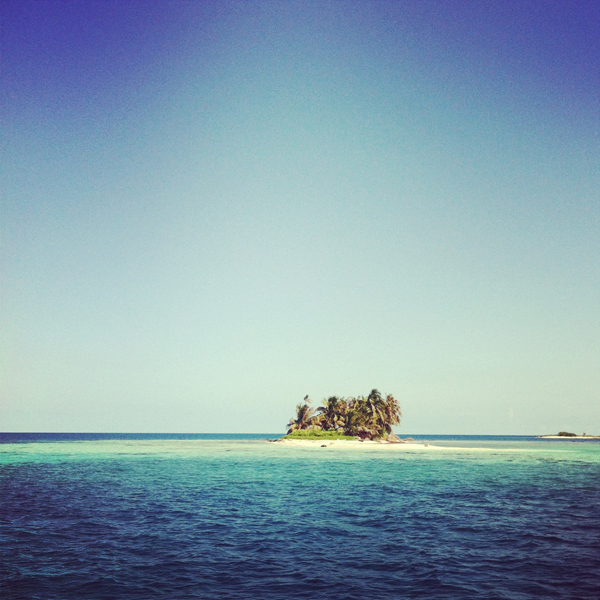 Silk Cayes in the distance. 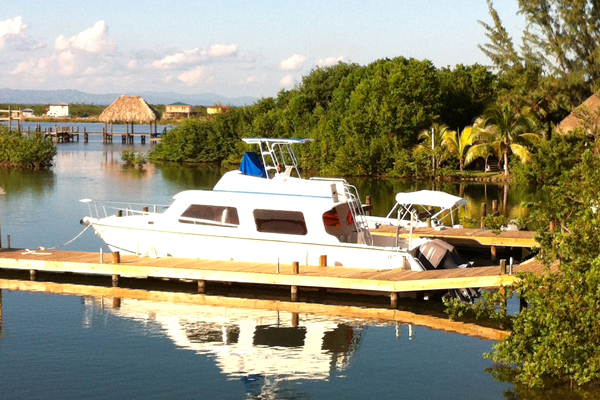 Mid-morning: Grab snorkeling gear and suntan lotion at the dive shop and jump aboard the resort's 46-foot boat, Miss Ellie. Coast along the smooth waters. The warm breeze is intoxicating; the sun above, a welcome orange ball. It's crystal clear for miles. 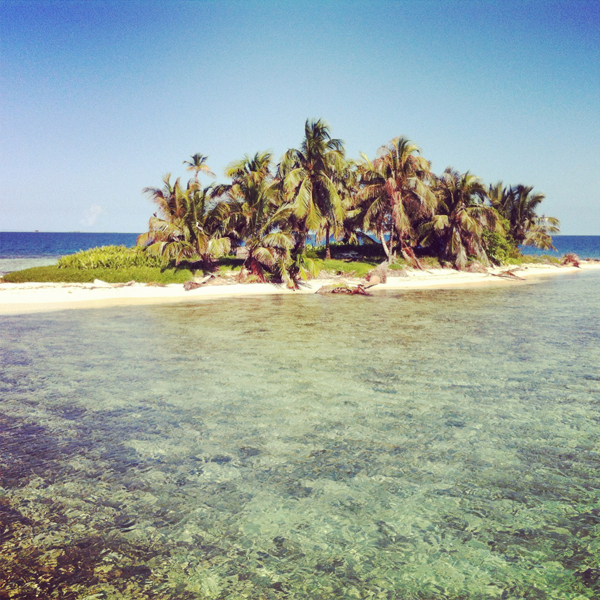 Twenty one miles out, anchor at the utterly private Silk Cayes, two deserted islands on the protected Belize Barrier Reef. Retreat into the shallow turquoise water, experiencing the depths of changing blue magic. Like diving, snorkeling is a singular, awe-inspiring activity, all breath and vision. Under the water's surface lies a surreal, Avatar-inspiring adventure — fans of magnificent colorful coral, vibrant schools of fish, prime marine life. Count your tally: three sting rays, two lemon sharks, one barracuda. Feel like a small speck in the vastness of the sea's treasures. Lunch: You're living a Corona Extra TV commercial, you know, the one with a bottle, palm trees, seagull soundtrack, and crystal sea. Serious bliss. Fill a globlet with chilled rosé and start on the beach picnic: hand-cut chips and salsa, grilled chicken and fish, freshly baked chocolate chip cookies. 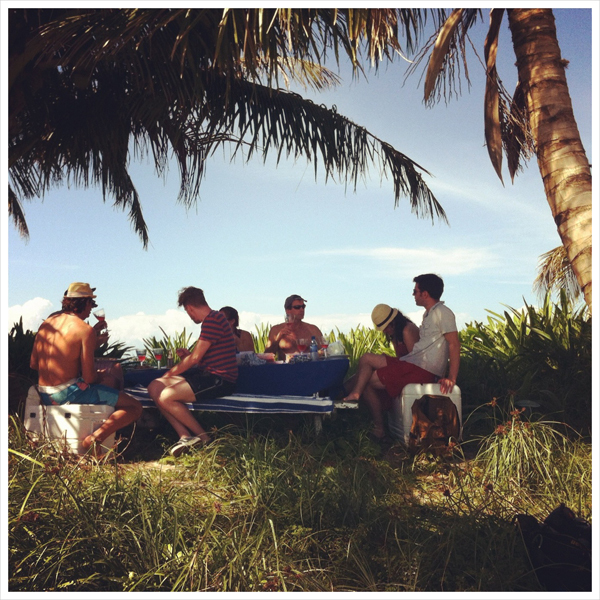 Beach picnic on Silk Cayes. 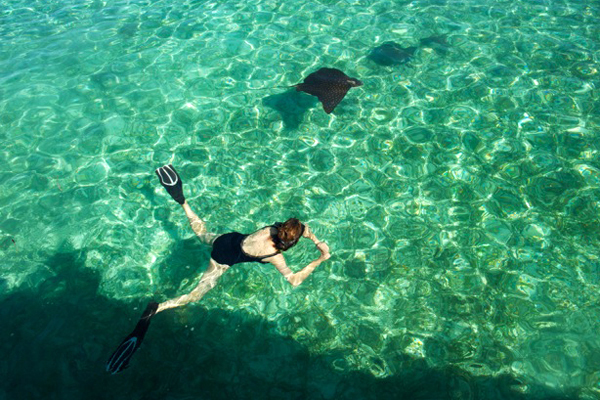 Kate swimming with spotted eagle rays. Photo: Neil Rogers. Mid-afternoon: Back aboard Miss Ellie. Ride shotgun on the bow, letting the wind whip you dry, soaking Central America's rays. Anchor at another major snorkeling site and swim with beautiful, endangered Hawksbill sea turtles and spotted eagle rays. The sheer size and gentle nature of both are awe-inspiring. (Remember, no touching.) It's hard to leave the water. Try your hand at trawling inside the barrier reef. 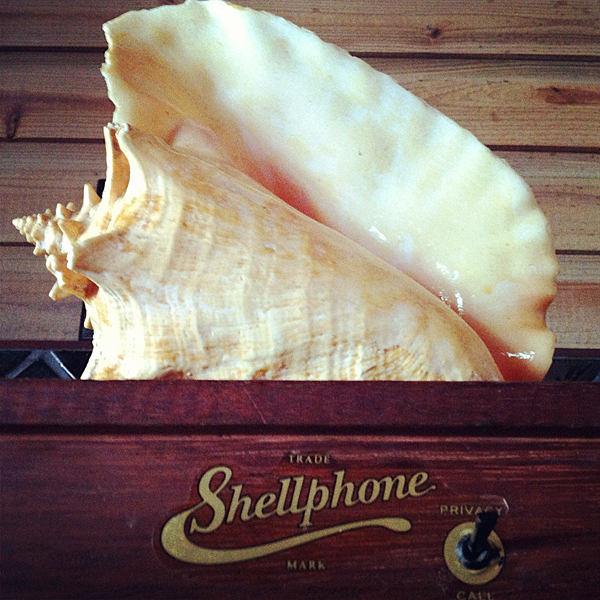 The fish aren't biting, so go for plan B: Your friend Jimmy hijacks the captain's iPod dock. Goodbye Bob Marley, hello dance music party. Pass the cold Beliken beers. Late afternoon: One last dive off Miss Ellie into the perfect, warm Caribbean for a short swim. You could idle for another few hours, but it’s getting late and the sun is setting. Look, another ocean treat: Dolphins. Dancing around, jumping and playing as the shoreline comes into view. Kate, on assignment and very happy. Sunset: Day ushers nightfall and ends with family supper. Anticipation runs high for the Dutch-Indonesian feast rijsttafel (translation: "rice table"), a culinary collaboration between Coppola and Turtle Inn's Dutch manager, Martin Krediet. The festive, elaborate spread includes sateh ayam (grilled chicken skewers with peanut sauce), babi kecap (pork belly in sweet soy sauce), rendang (beef in coconut milk, chili, and spices) and sambal gudang (shrimp with petah beans and coconut sauce), krupuk udang (shrimp crackers), oseng terong (eggplant stew), and serundeng (coconut flakes and shaved peanuts). Food coma successfully induced. 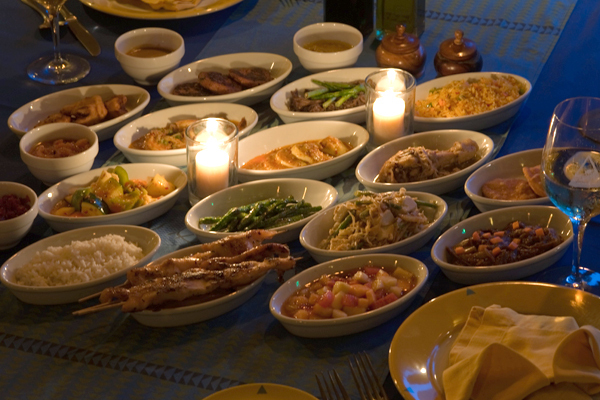 The rijsttafel spread. 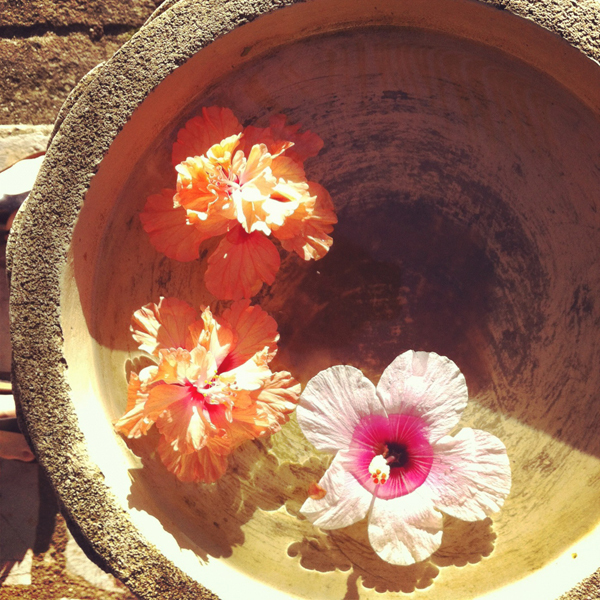 Photo: Courtesy of Francis Ford Coppola Resorts. Last Call: Rumors circulate about activities for tomorrow. Morning yoga, kayaking to Rum Point, an afternoon seafront Thai massage, and charcoal-grilled lobster dinner at Gauguin Grill, followed by a night in town, starting at American expat-owned Rumfish, followed by dancing at Barefoot Beach Bar, with last call at Tipsy Tuna. There will be no rest for the wicked. Back on your hammock, you still feel the gentle rocking of the boat as you replay the image of dolphins dancing, of the vibrant snorkel, of the inspired supper. Look up to see stars wink and glisten like diamonds in the distance. Count shooting stars. Tomorrow, you'll write an old-fashioned letter. 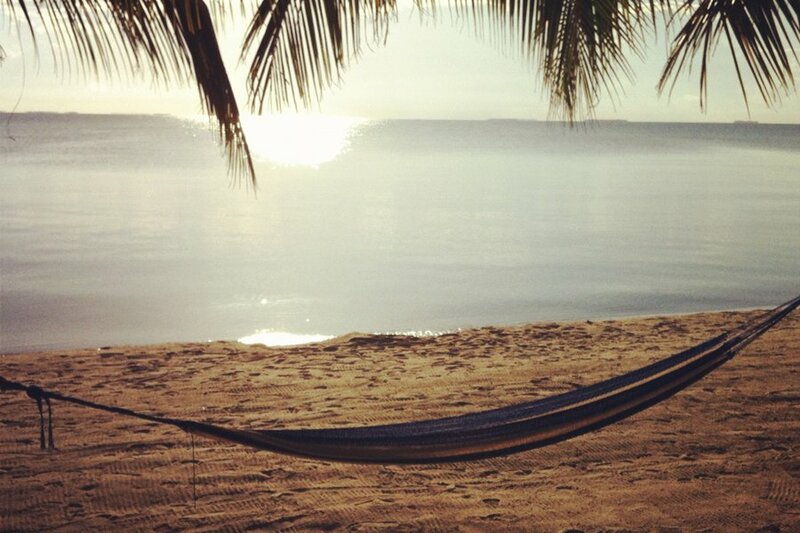 It will begin like this: Dear Mom, I'm not coming home from Belize. Ever. 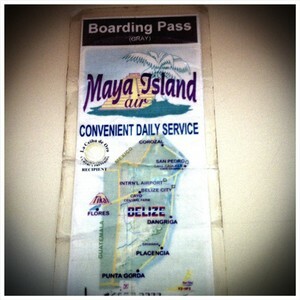 How to Get to Turtle Inn: Maya Island and Tropic Air fly to Placencia from Belize Municipal (TZA) and Belize International (BZE). A Turtle Inn driver will pick you up for the five-minute trip to Turtle Inn. Kate is a freelance writer and photographer. She contributes to T Magazine, Wall Street Journal Magazine, Conde Nast Traveler, Architectural Digest, and Vogue. Follow her on Twitter and Instagram. She travels for the adventure, a touch of chill, and always for the food. En transit, she prefers Charlottes Web CBD oil over the chill pill.